We have talked about what many locals refer to as Virginia’s flagship red wine or the local red alternative in the past. If you missed the entry, click here for a little bit about the other Cabernet. While popular French red wine grape varieties such as Cabernet Sauvignon, Merlot, and Pinot Noir can be found in Virginia, none are quite as suited for the east coast as Cabernet Franc, it appears. Cabernet Franc grows well in cooler climates, and more importantly, it ripens early. Thus Virginia and Upstate New York have taken a likening to this grape that has traditionally been used for blending in the Bordeaux region of France. Funny how a change in venue, or lets call it terroir, can promote you from a minor blending grape, to an important and favored varietal wine. If readers recall, I hosted a Cabernet Franc blind tasting last year and the 2002 Corcoran Vineyards (formerly known as Waterford) Cabernet Franc did very well, placing 2nd, close behind an example from the village of Chinon, Cabernet Franc’s birthplace, which pleased everyone. Corcoran Vineyards continues their success with Cabernet Franc, and even though stylistically, the 2005 differs from the 2002, it is one of the best of the 2005 Virginia vintage in my opinion. The 2005 Corcoran Vineyards Cabernet Franc is a young wine that offers an inviting bouquet, and displays a nice deep ruby color, and comes right out of the bottle showing a little muscle. A small percentage of Malbec, another French grape variety primarily used for blending, was added to this bottling likely for complexity. This is the perfect wine to pour into your attractive and shapely decanter for 2 hours or so and take note of how this medium bodied wine tames and opens up – literally blossoming into a precious rose. The tannins soften to a pleasant level of ripeness and the aromas become richer and the red fruit flavors emerge and are bountiful with soft nuances of herbs, spice and black pepper. Much like the 2002, this wine can be your evening companion sipped on its own, or try pairing it with roasted lamb, braised veal, or meat dishes that have nominal amounts of herb and pepper. Drink this now, or hold onto it -it will get better with time, again, much like the tasty 2002. Corcoran Vineyards Pond and Picnic area - Beautiful !!! So where can you find this wine? 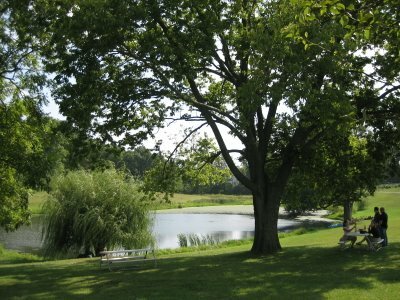 If you are local, visit the winery in the charming and historic village of Waterford (Loudoun County) and enjoy a day picnicking out by the pond and mature trees. For my friends who are outside of Virginia contact the winery at 540.882.9073 and find out about shipping to your state. Corcoran Vineyards also offers several other varietal wines and pretty much has something to cover any palate preference. When you visit, be sure to say “hi” to my pal Corky in the tasting room, who is a big proponent of Malbec and its health benefits, and let the kind folks at Corcoran know you read about them here on Dezel’s Virginia Vine Spot.